This web page represents a legal document that serves as our Terms of Service and it governs the legal terms of our website, https://orchestre-ojv.ca, and any associated web-based and mobile applications (collectively, "Website"), as owned and operated by Orchestre de Jeux Vidéo. After any revisions to our Legal Terms are posted, you agree to be bound to any such changes to them. Therefore, it is important for you to periodically review our Legal Terms to make sure you still agree to them. By accessing this website, you are agreeing to be bound by this Website Terms and Conditions of Use, all applicable laws and regulations, and agree that you are responsible for GDPR compliance with any applicable local laws. If you do not agree with any of these terms, you are prohibited from using or accessing this site. The materials contained in this Website are protected by applicable copyright and trademark law. This is a legally binding agreement between Orchestre de Jeux Vidéo and you for the provision of the services requested, and these terms shall govern the agreement between you and us to the ruling out of any other terms or conditions. Orchestre de Jeux Vidéo, reserves the right to refuse products/services to anyone for whatsoever reason and to terminate the contracts at any time. We may also at our sole discretion and for any reason, delete any information, pictures, comments or any other material posted by users. All users/clients can access and use our website at no cost at all. You can use the website to purchase your favorite https://orchestre-ojv.ca tickets or services on the https://orchestre-ojv.ca website and also read our blog; at absolutely no cost to you if you are a client of the website. Orchestre de Jeux Vidéo may disclose your personal information if we are required by law to do so or if you violate our Terms of Service. Orchestre de Jeux Vidéo website may allow third-parties, including our authorized service providers and advertising companies to display ads on our website. Some of these companies use tracking technologies such as cookies, to acquire information about the users who view or interact in some way with their advertisements. Please note that our website does not disclose any personal detail to these third parties, in this regard. When you use Orchestre de Jeux Vidéo website, or send e-mails, text messages, and other communications from your desktop or mobile device to us, you may be communicating with us electronically. You consent to receive communications from us electronically, such as e-mails, texts, mobile push notices, or notices and messages on this site or through the other Orchestre de Jeux Vidéo products or services, such as our Message Center, and you can retain copies of these communications for your records. If the basis changes then if required by law Orchestre de Jeux Vidéo shall notify you of the change and of any new basis under which we have determined that we can continue to process your information. Except we otherwise state so, all materials, which without limitation includes pictures, graphics, designs, pictures, videos, icons, and written materials found on and made available through https://orchestre-ojv.ca are copyrighted, trademarked, controlled or licensed by Orchestre de Jeux Vidéo, its affiliates or by their respective creators. All said materials are protected by the Quebec laws and international copyright laws. Our website, logos, scripts, page headers, button icons, and product names included in or made available through https://orchestre-ojv.ca are trademarks or trade dress of Orchestre de Jeux Vidéo in Canada and other countries. You are banned from using, republishing, reproducing, transmitting, copying, changing, or distributing the trademarks found on this website in any way without Orchestre de Jeux Vidéo prior clear written consent. Some other products marks, trademarks, and logos provided on the Orchestre de Jeux Vidéo website are the products marks or trademarks of third parties and must not be used, reproduced or copied without the written permission of the owner. You shall not upload, distribute, or otherwise publish through this Site any Content, information, or other material that (a) includes any bugs, viruses, worms, trap doors, Trojan horses, or other harmful code or properties; (b) is libelous, threatening, defamatory, obscene, indecent, pornographic, discriminatory, or could give rise to any civil or criminal liability under the Quebec laws or the laws of any other country that may apply; or (c)violates or infringes upon the copyrights, patents, trademarks, service marks, trade secrets, or other proprietary rights of any person. Orchestre de Jeux Vidéo may give you an account identification and password to enable you to access and use certain portions of this Site. Each time you use a password or identification, you are deemed to be authorized to access and use the Site in a manner consistent with the terms and conditions of this agreement, and https://orchestre-ojv.ca has no obligation to investigate the source of any such access or use of the Site. For user convenience, we may provide third parties links on the website to other website, website and online resources. You are warned not to take the inclusion of such hyperlinks as Orchestre de Jeux Vidéo endorsement of the content, procedures, and/or services, of that third party website except we tell you so. There are several links to other website on https://orchestre-ojv.ca. You must note that these third party websites have different privacy policies than we do, and that we are in no way responsible for the way they may ask for and collect information from you and/or the way they use and disclose such information. Orchestre de Jeux Vidéo always does its utmost to protect your personal information. To prevent illegal access, maintain data accuracy, and ensure the proper use of information, we use practical administrative practices and actions to protect your information. You however understand that there is no full assurance of security for information made available on or through the internet. Orchestre de Jeux Vidéo will thus not bear responsibility for unauthorized access to your information that is beyond our control. Registered Users of the Website might post evaluations and remarks of a product and services purchased by means of the Website, so long as the Material is not unlawful, profane, threatening, defamatory, an invasive of privacy, infringing of intellectual property rights, or otherwise injurious to third parties or objectionable and does not include industrial solicitation, mass mailings, or any type of "spam." You may not use another User's account to impersonate a User or entity, or otherwise deceive as to the origin of the opinions. Orchestre de Jeux Vidéo reserves the right (however is not bound) to eliminate or modify such Material, but does not regularly examine posted Material. You understand and accept that Orchestre de Jeux Vidéo does not knowingly collect personal information from minors under the age of 18. If we learn that we have received personal information from a child or another ineligible user, Orchestre de Jeux Vidéo will delete that information as quickly as possible. THE INFORMATION, SOFTWARE, PRODUCTS, AND SERVICES INCLUDED IN OR AVAILABLE THROUGH THE SITE MAY INCLUDE INACCURACIES OR TYPOGRAPHICAL ERRORS. CHANGES ARE PERIODICALLY ADDED TO THE INFORMATION HEREIN. Orchestre de Jeux Vidéo AND/OR ITS SUPPLIERS MAY MAKE IMPROVEMENTS AND/OR CHANGES IN THE SITE AT ANY TIME. Orchestre de Jeux Vidéo AND/OR ITS SUPPLIERS MAKE NO REPRESENTATIONS ABOUT THE SUITABILITY, RELIABILITY, AVAILABILITY, TIMELINESS, AND ACCURACY OF THE INFORMATION, SOFTWARE, PRODUCTS, SERVICES AND RELATED GRAPHICS CONTAINED ON THE SITE FOR ANY PURPOSE. TO THE MAXIMUM EXTENT PERMITTED BY APPLICABLE LAW, ALL SUCH INFORMATION, SOFTWARE, PRODUCTS, SERVICES AND RELATED GRAPHICS ARE PROVIDED “AS IS” WITHOUT WARRANTY OR CONDITION OF ANY KIND. Orchestre de Jeux Vidéo AND/OR ITS SUPPLIERS HEREBY DISCLAIM ALL WARRANTIES AND CONDITIONS WITH REGARD TO THIS INFORMATION, SOFTWARE, PRODUCTS, SERVICES AND RELATED GRAPHICS, INCLUDING ALL IMPLIED WARRANTIES OR CONDITIONS OF MERCHANTABILITY, FITNESS FOR A PARTICULAR PURPOSE, TITLE AND NON-INFRINGEMENT. TO THE MAXIMUM EXTENT PERMITTED BY APPLICABLE LAW, IN NO EVENT SHALL Orchestre de Jeux Vidéo AND/OR ITS SUPPLIERS BE LIABLE FOR ANY DIRECT, INDIRECT, PUNITIVE, INCIDENTAL, SPECIAL, CONSEQUENTIAL DAMAGES OR ANY DAMAGES WHATSOEVER INCLUDING, WITHOUT LIMITATION, DAMAGES FOR LOSS OF USE, DATA OR PROFITS, ARISING OUT OF OR IN ANY WAY CONNECTED WITH THE USE OR PERFORMANCE OF THE SITE, WITH THE DELAY OR INABILITY TO USE THE SITE OR RELATED SERVICES. Orchestre de Jeux Vidéo reserves the right, in its sole discretion, to terminate your access to the Site and the related services or any portion thereof at any time, without notice. To the maximum extent permitted by law, this agreement is governed by the laws of Canada and you hereby consent to the exclusive jurisdiction and venue of courts of Quebec & Canadian Courts in all disputes arising out of or relating to the use of the Site. Use of the Site is unauthorized in any jurisdiction that does not give effect to all provisions of these Terms, including, without limitation, this section. You agree that no joint venture, partnership, employment, or agency relationship exists between you and Orchestre de Jeux Vidéo as a result of this agreement or use of the Site. Orchestre de Jeux Vidéo performance of this agreement is subject to existing laws and legal process, and nothing contained in this agreement is in derogation of Orchestre de Jeux Vidéo right to comply with governmental, court and law enforcement requests or requirements relating to your use of the Site or information provided to or gathered by Orchestre de Jeux Vidéo with respect to such use. Unless otherwise specified herein, this agreement constitutes the entire agreement between the user and Orchestre de Jeux Vidéo with respect to the Site and it supersedes all prior or contemporaneous communications and proposals, whether electronic, oral or written, between the user and Orchestre de Jeux Vidéo with respect to the Site. The Orchestre de Jeux Vidéo website provided on an “as is” basis, and we give no warranties or assurance that it will satisfy your expectations or meet your requirements. You may be unable to successfully browse the website/or use some parts of our products if your computer/ browsing gadget does not support relevant technology such as encryption. SINCE THE WEBSITE IS GAINED ACCESS TO THROUGH THE INTERNET, WHICH IS AUTONOMOUS OF US, YOUR USE OF THE INTERNET IS SOLELY AT YOUR OWN RISK AND SUBJECT TO ALL APPROPRIATE GDPR COMPLIANCE, AND INTERNATIONAL LAWS AND RESTRICTIONS. Orchestre de Jeux Vidéo SHALL IN NO EVENT BE LIABLE FOR ANY CLAIM ARISING OUT OF YOUR USE OF THE WEBSITE OR ITS CONTENTS, INCLUDING WITHOUT LIMITATION ANY ACTION TAKEN, OR ANY RESOLUTION MADE BY YOU IN DEPENDENCE UPON SUCH CONTENT, OR FOR DAMAGES AND LOSSES SUFFERED, WHETHER IMMEDIATE, SIGNIFICANT, EXTRAORDINARY, REMEDIAL, INDIRECT OR SOMETHING ELSE, EVEN IF Orchestre de Jeux Vidéo HAS BEEN EDUCATED CONCERNING THE LIKELIHOOD OF SUCH HARMS. The materials on Orchestre de Jeux Vidéo Website are provided "as is" Orchestre de Jeux Vidéo makes no warranties, expressed or implied, and hereby disclaims and negates all other warranties, including without limitation, implied warranties or conditions of merchantability, fitness for a particular purpose, or non-infringement of intellectual property or other violation of rights. Furthermore, Orchestre de Jeux Vidéo does not warrant or make any representations concerning the accuracy, likely results, or reliability of the use of the materials on its Internet Website or otherwise relating to such materials or on any sites linked to this site. The Website serves as a venue for Individuals to purchase distinct service or tickets. Neither Orchestre de Jeux Vidéo nor the Website has control over the quality or fitness for a particular function of a tickets or products. Orchestre de Jeux Vidéo likewise has no control over the accuracy, reliability, completeness, or timeliness of the User-submitted details and makes no representations or warranties about any info on the Site. 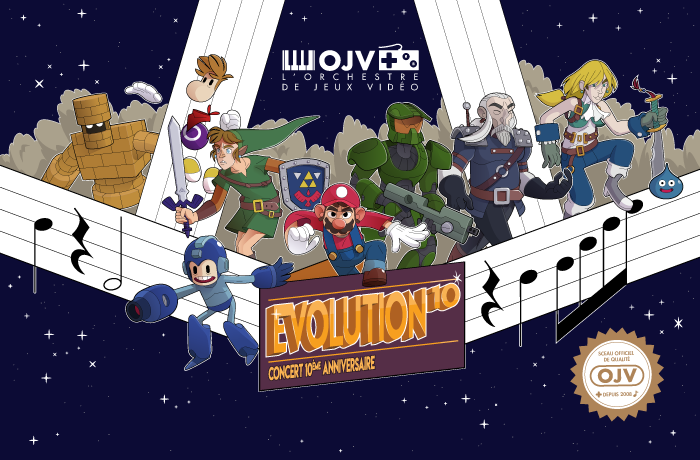 THE WEBSITE AND ALL DETAILS, CONTENT, MATERIALS, PRODUCTS (INCLUDING SOFTWARE APPLICATION) AND SERVICES LISTED ON OR OTHERWISE MADE AVAILABLE TO YOU THROUGH THIS WEBSITE ARE PROVIDED BY Orchestre de Jeux Vidéo ON AN "AS IS" AND "AS AVAILABLE" BASIS, UNLESS OTHERWISE SPECIFIED IN WRITING. Orchestre de Jeux Vidéo MAKES NO REPRESENTATIONS OR WARRANTIES OF ANY KIND, EXPRESS OR IMPLIED, ABOUT THE OPERATION OF THIS WEBSITE OR THE INFO, MATERIALS, PRODUCTS (INCLUDING SOFTWARE) OR SERVICES LISTED ON OR OTHERWISE MADE AVAILABLE TO YOU THROUGH THIS SITE, UNLESS OTHERWISE POINTED OUT IN WRITING. YOU EXPRESSLY AGREE THAT YOUR USE OF THIS WEBSITE IS AT YOUR OWN RISK. The materials appearing on Orchestre de Jeux Vidéo Website could include technical, typographical, or photographic errors. Orchestre de Jeux Vidéo does not warrant that any of the materials on its Website are accurate, complete, or current. Orchestre de Jeux Vidéo may make changes to the materials contained on its Website at any time without notice. Orchestre de Jeux Vidéo does not, however, make any commitment to update the materials. If you utilize the Website, you are accountable for maintaining the confidentiality of your account and password and you accept responsibility for all activities that happen under your account and password. You also accept not to reveal any personally identifiable information, consisting of, however not limited to, first and last names, credentials, or various other details of a personal nature ("Personal Data") from the Site. Your disclosure of any Personal Data on the website might result in the immediate termination of your account. Orchestre de Jeux Vidéo additionally reserves the right to refuse service, terminate accounts, and remove or edit Content at its sole discernment. Orchestre de Jeux Vidéo does not guarantee the truthfulness, precision, or dependability of Content on the site, consisting of Personal Data. Each Individual is accountable for upgrading and changing any pertinent account info when essential to preserve the truthfulness, precision, or reliability of the details. The Service is controlled, operated and administered by Orchestre de Jeux Vidéo from our offices within Quebec, Canada. If you access the Service from a location outside Canada, you are responsible for compliance with all local laws. You agree that you will not use the Orchestre de Jeux Vidéo Content accessed through Orchestre de Jeux Vidéo in any country or in any manner prohibited by any applicable laws, restrictions or regulations. You hereby agree to protect, safeguard and hold Orchestre de Jeux Vidéo Website, its owners, affiliated companies, and their managers, directors, officers, and employees blameless and innocent against all liabilities, charges, damages, legal costs and accounting fees and all other expenses related to any claims or any legal actions brought against Orchestre de Jeux Vidéo Website because of your breach of any portion of these terms or any other liabilities connected to your use of this website. All content included as part of the Service, such as text, graphics, logos, images, as well as the compilation thereof, and any software used on the Site, is the property of Orchestre de Jeux Vidéo or its suppliers and protected by copyright and other laws that protect intellectual property and proprietary rights. You will not modify, publish, transmit, reverse engineer, participate in the transfer or sale, create derivative works, or in any way exploit any of the content, in whole or in part, found on the Site. 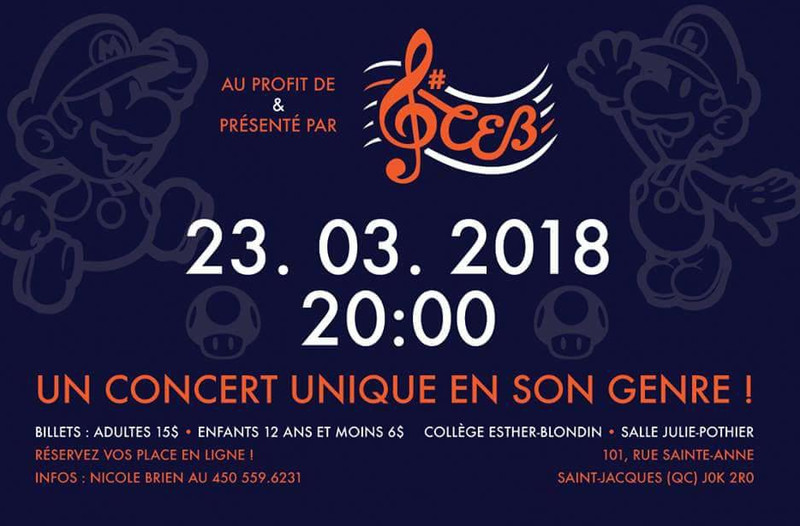 Orchestre de Jeux Vidéo content is not for resale. You will use protected content solely for your personal use, and will make no other use of the content without the express written permission of Orchestre de Jeux Vidéo and the copyright owner. You agree that you do not acquire any ownership rights in any protected content. We do not grant you any licenses express or implied, to the intellectual property of Orchestre de Jeux Vidéo or our licencors except as expressly authorized by these Terms. Our Legal Terms shall be treated as though it were executed and performed in the United States of America and Canada and shall be governed by and construed in accordance with the laws of the Courts of Quebec without regard to conflict of law principles. In addition, you agree to submit to the personal jurisdiction and venue of such courts. Any cause of action by you with respect to our Website, must be instituted within one (1) year after the cause of action arose or be forever waived and barred. Should any part of our Legal Terms be held invalid or unenforceable, that portion shall be construed consistent with applicable law and the remaining portions shall remain in full force and effect. To the extent that any Content in our Website conflicts or is inconsistent with our Legal Terms, our Legal Terms shall take precedence. Our failure to enforce any provision of our Legal Terms shall not be deemed a waiver of such provision nor of the right to enforce such provision. The rights of Orchestre de Jeux Vidéo under our Legal Terms shall survive the termination of our Legal Terms. Orchestre de Jeux Vidéo (‘we, us’) is committed to maintaining user privacy on our website. Orchestre de Jeux Vidéo & Instasky respects the privacy of all its website users. We take seriously the protection of your privacy and confidentiality. We understand that all visitors to our website are entitled to know that their personal data will not be used for any purpose unintended by them, and will not accidentally fall into the hands of a third party. Whilst Orchestre de Jeux Vidéo do take all reasonable steps to make sure that the information on this website is up to date and accurate at all times we do not guarantee that all material is accurate and or up to date. The entire copyright and other intellectual property rights Orchestre de Jeux Vidéo website and the material on our website are reserved.